Dr. Jensen is a 1995 graduate of Ohio State University College of Veterinary Medicine and in the spring of 2002 opened Hyde Park Veterinary Clinic. Dr. Jensen has a special interest in canine behavior and training, nutrition, and animal welfare. Dr. Jensen is a trip leader for World Vets, an NGO that provides spay/neuter services and veterinary aid in developing countries. Dr. Jensen lives around the corner from the clinic with her husband, Chris. They have 4 dogs, Antonella, Micro, Shorty and Suki. Dr. Jensen also has an African grey parrot that she has had for 25 years, as well as 2 parakeets, 3 large tortoises and a koi pond. In her spare time, Dr. Jensen enjoys scuba diving, paddle-boarding, and adventure travel. Dr. Mueller is a 1999 graduate of Ohio State University College of Veterinary Medicine and practiced for 7 years near Washington D.C before joining Hyde Park Veterinary Clinic in 2006. Dr. Mueller has a special interest in integrative medicine and specifically herbal medicine. She has advanced training in herbal therapy and is a Certified Veterinary Herbalist. 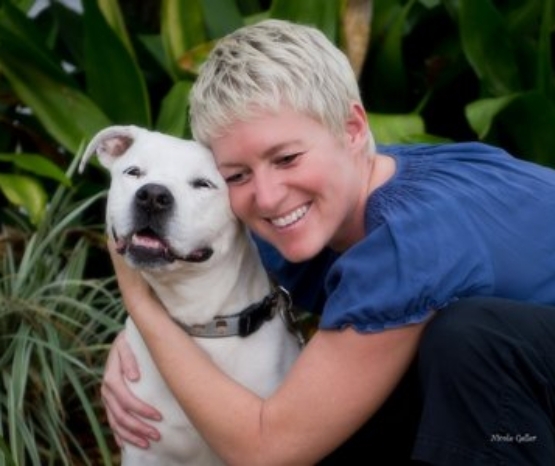 Dr. Mueller lives in St. Pete with her husband, Jayme and her dog Luna. Luna was a street dog in the Dominican Republic until Dr. Mueller rescued her in 2013. In her spare time, Dr. Mueller enjoys traveling, scuba diving, cycling, kayaking, art, and gardening. Dr. Dunser is a 1999 graduate of Tufts School of Veterinary Medicine and has practiced in Florida since then. She is a Certified Veterinary Acupuncturist and believes in treating the patient, not just the disease. Dr. Dunser has been providing her services part time to HPVC since 2003, and officially joined our team as our third veterinarian in 2012. Dr. Dunser shares her home on Davis Island with her husband, two children, their dog Rosie, their cat Cin Cin, their pet rat Noodle, and 3 Silkie chickens. In her free time, Dr. Dunser enjoys snorkeling, yoga, and other outdoor adventures. Dr. Jillian Arambula is a graduate of the College of Veterinary Medicine Class of 2015 at Michigan State University. Jillian was born and raised in Detroit, MI but relocated to Florida with her boyfriend and Mini Aussie, "Bitty"; finally realizing her dream of living near the beach and sun. Dr. Arambula feels fortunate to be able to care for the human-animal bond and loves helping people through helping their pets. She has a special interest in dentistry, as well as general surgery and the therapeutic impact of pets on their humans. In addition to clinical practice, Jillian is passionate about family, sports, exercise, cinema, food, and simply enjoying life. Preston is a long time resident of Florida and graduated from the Veterinary Technology Program at St. Petersburg College in 2004. She worked for many years as a Certified Veterinary Technician before joining HPVC in December 2013. In December of 2017 Preston earned her Bachelor’s degree in Veterinary Technology from St. Petersburg College and is now pursuing her certification as a veterinary Practice Manager. When she isn’t busy managing our team, she spends her time rehabilitating and fostering rescue dogs, and caring for her dog, Dottie, and her cat, Stephen Colbert. Sara earned her Bachelor of Science from the University of the South and has been working at HPVC since the practice opened in 2002. She earned her CVT from the St. Petersburg Veterinary Technology Program in 2004. Her dedication to her profession is evident through the continuing education she pursues and she recently achieved her Low Stress Handling Certification. Sara is one of our lead surgery and dental technicians. She shares her home with her two cats, Maizy and Milly. Keleigh earned an Associate of Arts from Jacksonville Community College in 1992, followed by a Bachelor of Science in Chemistry from FSU in 1994, and a Bachelor of Science in Biology from USF in 1996. She has worked in the veterinary field since 1991 including positions in zoos, private practices and emergency clinics. She joined HPVC in April 2008 and currently holds the position of medical scribe. Keleigh shares her home with her Chihuahua, Phillie. After moving to Tampa from Wisconsin in 2004, Amanda completed an associate’s degree in Veterinary Technology from St. Petersburg College. She worked as a technician for a number of years before joining our team in August 2012. She is cross trained to help in all areas of the hospital and we rely on her expertise in multi-tasking, as well as her ability to assist with our most anxious canine and feline patients. Amanda is certified in Low Stress Handling and she continues to educate herself on recent advancements in veterinary medicine. She shares her home with her 2 cats, Momma Kitty and Pixie. Jason moved to Tampa from Ireland when he was 8 years old and began working in the veterinary field at the age of 17. Jason joined the HPVC team in early 2015 and has excelled in client education as a lead exam room technician. He is our resident photographer and his “pet of the day” posts on our Facebook page have quickly become a favorite of clients. He shares his home with two cats, Reba and Rupert. Cory is a native to Florida and has been working in the veterinary field since 2003. In addition to his many valuable contributions as a veterinary technician, he also manages the clinic’s website and operates his own business selling custom made collectible toys. He shares his home with 2 cats and 2 dogs. Gina earned her bachelor’s degree from USF in 2015 and became certified in Veterinary Technology from St. Petersburg College. She joined our team in September 2016. Her work ethic and obvious love for animals has been a great addition to our group, and we look forward to her continued growth in the veterinary field. She lives with her dog Nimbus and 2 cats Elphaba & Theodore. Anya was born in Russia and moved to America as a young child. She first started working with animals when she volunteered with an animal rescue while in high school. Since then, she has studied at USF and eventually graduated from Hillsborough Community College in May 2017. She officially earned her certification in Veterinary Technology in August 2017. Anya joined the HPVC team in September 2017 and has become a valued member of our group. She lives in Tampa with her rabbit and 3 cats. Lauren graduated from Auburn University in 2018 with a Bachelor’s Degree in Animal Sciences and is planning to attend veterinary school in the very near future. She started as a student volunteer at our clinic and became an official part of the HPVC family in June. Lauren’s passion for animals fuels her aspiration of becoming a small animal veterinarian and makes her a valuable addition to our clinic. She lives in Tampa with her family, her two dogs “Lola” and “Sophie”, and her cat “Ashley”. Marina was born in New York State and she started her career in the veterinary field as a volunteer at a local New York clinic. Eventually she worked her way up to a technician, and a couple of years ago moved with her family to Tampa. She is currently attending St. Petersburg College and pursuing her veterinary technician certification. In her spare time, she enjoys spending time with her boyfriend, friends and family. She shares her home with her dog Luna and 2 turtles. Tessa is originally from Michigan and moved to Tampa Bay in 2008 after spending 5 years in the Washington D.C. area. She has been working in the veterinary field since 2004 and joined HPVC in April 2015. Tessa is currently our front desk manager and her invaluable experience on the front lines of veterinary medicine allows our doctors to successfully accommodate as many of our patients as possible each day. Tessa’s furry family includes her 3 cats, Bella, Chino and Daysie. Mai was born in Japan, and lived in Atlanta before moving to Tampa in 2016. She earned a bachelor’s degree in Psychology from Kennesaw State University and hopes to pursue a career in veterinary medicine. She joined our team in November 2016 and has been a quick study in navigating the responsibilities of the front desk staff. She shares her home with 2 dogs, 4 cats and a turtle. David was born in Miami and moved to the Tampa area in October 2017. He joined our team as a receptionist and has proved to be a integral part of our group. David has worked in the veterinary field for 14 years and brings with him excellent client and patient care experience. He lives in Tampa with his girlfriend and 2 cats. Jenn was born in Buffalo, NY and moved to the Tampa area when she was 7 years old. She started her veterinary career in 2007 as a receptionist and has worked in various positions such as veterinary lab technician. She also dedicates her time to volunteering and fostering for local rescues. Jenn joined the HPVC team in January of 2018 and every day she proves her dedication and love for veterinary patient care. She shares her home with her husband, 6 dogs and 2 cats, all of whom are either senior or special needs animals. Jaime is originally from Boston and moved to Tampa in 2014. She earned her bachelor’s degree from UMass and worked in Higher Education before transitioning to the field of animal care and welfare. Jaime began working as a veterinary receptionist in 2004 and has been volunteering at various cat shelters since 2003. Jaime joined the HPVC team in November 2018. In her spare time, she volunteers with the feral cat program at the Humane Society of Tampa Bay. She shares her home with her husband, 2 cats, and 1 rat.